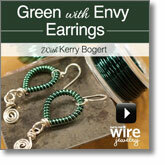 Learn how to add colorful wire coils to your wirework jewelry projects! Don't miss out on this jewelry making resource full of how-to instruction and materials so you can make your own wire coils. Have you ever wanted to add color and texture to your wirework without the use of patina? Wire coiling with colored wire is your answer! 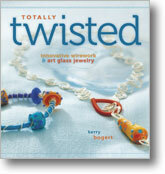 Add texture and a pop of color to your next wireworking project with the help of wire artist and author Kerry Bogert and this must-have collection! Let Kerry teach you everything you need to know about wire coiling. She will give you all the tips and tricks from how to create consistent coils by hand or using a wire-coiling tool to achieving consistency when making pairs and other multiples. Explore colorful wire coils by reading, watching, and experimenting with this unbeatable collection! Featuring must-have supplies and step-by-step instruction, you won't want to miss out on this complete wire-coiling collection for ONLY $55.00! Learn how to incorporate colored wire into your jewelry projects with designs that range from sophisticated to whimsical. Plus, get tips and tricks that will make wirework easier and allow you to create your own custom clasps and components. 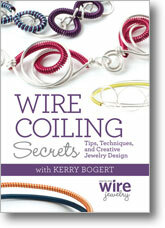 Uncover the secrets for coiling wire and adding colorful coils to your jewelry designs. Kerry will guide you through the nuances of working with different gauges of wire and different wire tools. Create a pair of fun and funky earrings that will make all of your friends green with envy. In less than 20 minutes you can learn how to make a pair of earrings and learn tips that will help you achieve symmetry and consistency when making pairs. Explore wire coiling with 20-gauge colored copper wire hand-picked by Kerry. Experiment with purple, magenta, yellow, Pacific blue, orange, and sea foam colored wire in your jewelry designs. Don't wait. Order your kit today!